Let me begin by saying I am a paper geek. I love notebooks and making lists. I use a lot of index cards. The last few years, I have tried to use note making apps on my phone but it really isn’t working – too easy to dismiss those reminders. And there is something about using a pen and writing notes and lists. That process seems to really plant the task in my head. 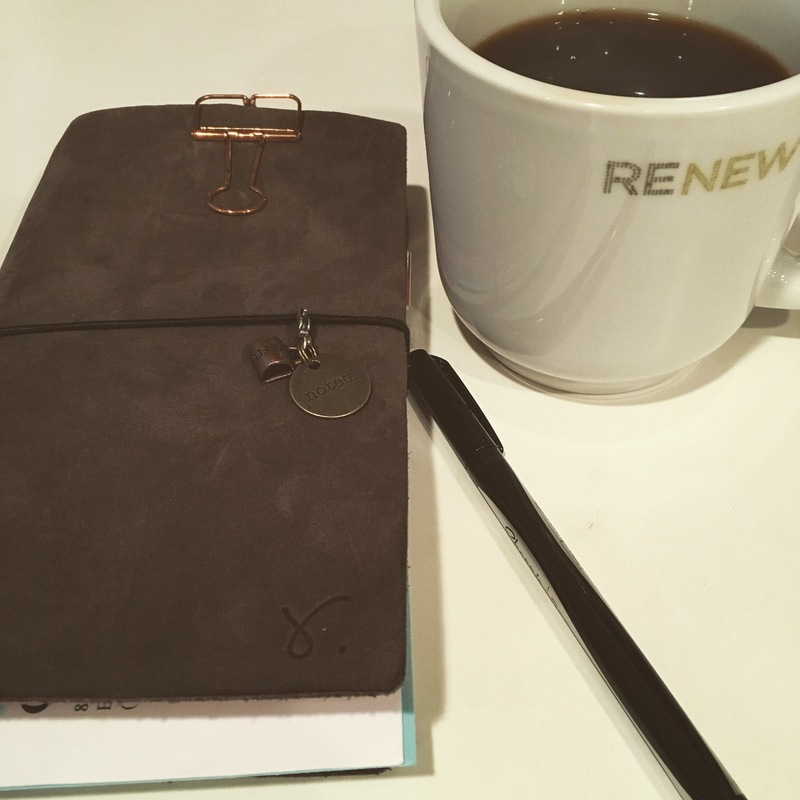 So today I am wondering if you ever tried bullet journaling? I have used bullet journaling for my work notebook for a few years but I am contemplating using it in my personal notebook for 2018. I love lists and I have plenty of empty notebook inserts for my everyday carry. I am using a week on one page calendar for events and reminders but I feel like a list making system might help me get the year off to a good start. I am not trying to wish away 2017 but isn’t it fun to begin to dream about the new year? Up much too early today, my head swirling with the details of the day ahead. Classroom parties, parent group celebration, tidying up my desk so I can leave work at work for the next two weeks. Spent some time listening to Magpie Murders, knitting a few rounds, and writing in this beautiful Tumeric notebook. Time to make a cuppa and get myself ready for the day. Fortunately the Friday night wine and cheese have been acquired so the evening ahead will be a lovely way to begin Christmas break. p.s. if you have some time, please visit this fun blog. Erin is a friend of my daughter and she’s is a very creative spirit. She also has the most lovely smile. 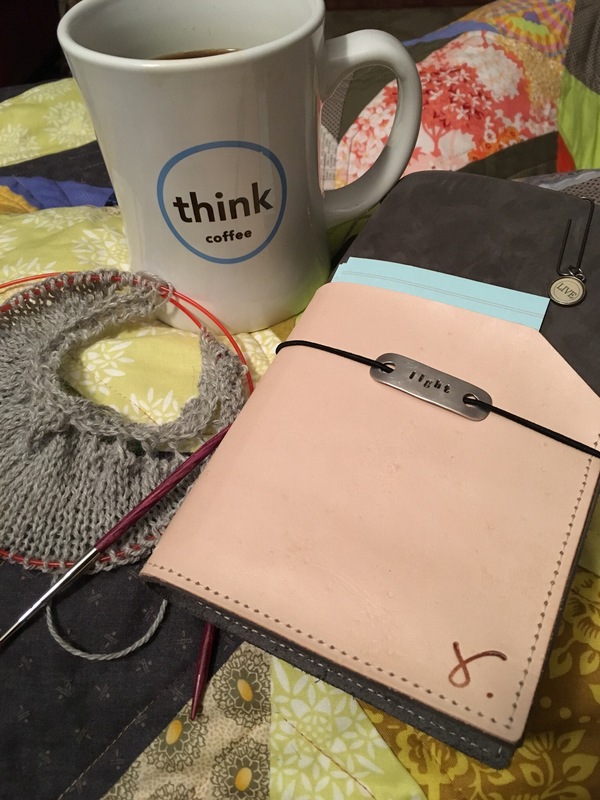 The Think Write Thursday topic for May 25, 2017 is to write about the contents of your purse. Are you a minimalist? Or do you carry around a knapsack? And say, what’s in there, anyway? Tell us what you’ve got in your purse and why!Happy writing! I love purses! For most of my adult life, I have switched up purses more than is reasonable. I think I have come to a place where I stick with one bag a bit longer but I am not a one bag only type – at least not yet. My current bag is a Namaste. I just switched back to this bag after carrying a Fossil bag since September. I needed some color in my life after a very wet and grey winter that lasted well into spring. I like to have enough space to carry the basics but still have room for a book or perhaps a knitting project. I have this wonderful organizer that holds many necessities (lip balm, tissues, lotion, hand sanitizer, pens, store cards). And best of all, if I want to change bags, I just lift it out and move it. Sweet deal. 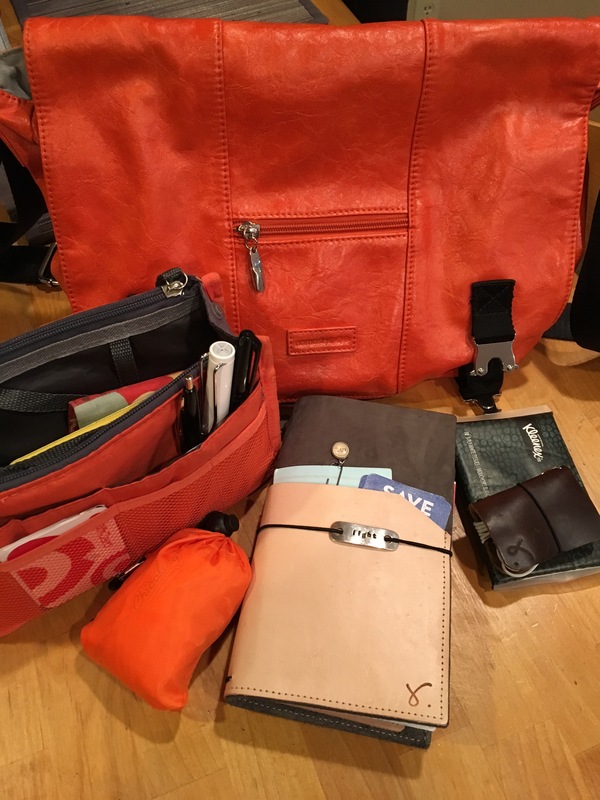 My Sojourner is a planner, journal, and wallet. I have a mini Sojourner that hold my earbuds, tissues, and a reusable grocery bag. I like to have exterior pockets for my phone and keys (so they don’t get lost in the bottom of my bag) and a long enough strap to cross over my body leaving my hands free. So there you have it. I am certainly not a minimalist. And, can you figure out my favorite color? We are finally getting some sunshine and blue skies! It looks like it won’t last long but I am grateful for this reprieve. I started my new shawl. Now I need to watch a video on adding beads before I move on. I have only added beads to one other project. Helen had a great video so I will rewatch her instructions first. I tried two other yarns befor settling on this grey yarn. My new notebook arrived. I just love the wrap around pockets. I transferred all of my inserts and pockets this weekend. I have been using a smaller wrap around for almost two years (also a Sojourner) but I wanted a bit more space for note taking and memory keeping. I have tried bullet journaling and daily planning and they don’t really work for me. I keep my calendar on my phone, multi-calendars actually. But I do love to have lists and place to make notes, write quotes or scriptures, capture ideas and book titles. So inside my Sojourner I have one dot grid notebook, a folder with slots for my I.D. And a bit of cash, and a plastic pocket holder for credit cards and receipts. I also have a small notebook for menu and grocery ideas. Finally I am using the font pocket to hold index cards with my weekly To Do lists. It is a flexible system. I am always looking for new ideas but I am also trying to keep it simple. I finished The Nix yesterday and yes, I loved this book. I had the audio version and it made me laugh out loud in my car several tims. Up next? Not sure but I have an ever growing list. Just a few weeks until Summer Book Bingo. Happy Wednesday and thanks to Kat for hosting Unraveled Wednesdays. The weeknd was full but low key. Christmas Eve was wonderful and Christmas Day brought some much needed time to sit and knit. Tomorrow I will move my dad back to his apartment and let him get settled into his routine. He has worked hard with the therapists and is getting stronger every day. I am so thankful that the stroke was small and did not do the kind of damage we have seen in other elderly friends. Today will be for making lists, picking up and putting away, cleaning out the fridge, a bit of laundry and some precious time with our tiny person. I usually write about yarn and books on Wednesdays but this week, I am a bit distracted. I can’t seem to get my needles settled on a project. I finished a hat and a shawl over the weekend. I acquired some lovely new yarn on Saturday. And I have spent a lot of time going through my library of patterns to find just the right project. I did start another shawl. And I have those sleeves waiting. But what I need is a simple enough hat that can be picked up between the cleaning and getting ready chores. So, instead of writing about yarn and books this morning, I am going to tell you about my beautiful notebook. I bought this notebook last summer and started using it as my everyday carry in August. I have a wallet insert and two notebooks, one for daily jottings and one for special words and ideas. I have a dashboard folder with sticky notes and a place for stashing bits of paper. When I pull this lovely out at a store, I get a lot of oohs and aahs. This notebook has really helped me keep my purse and my brain in order. But I also love the story of this notebook and the maker. Rowena has created a lovely little community with her notebook making. 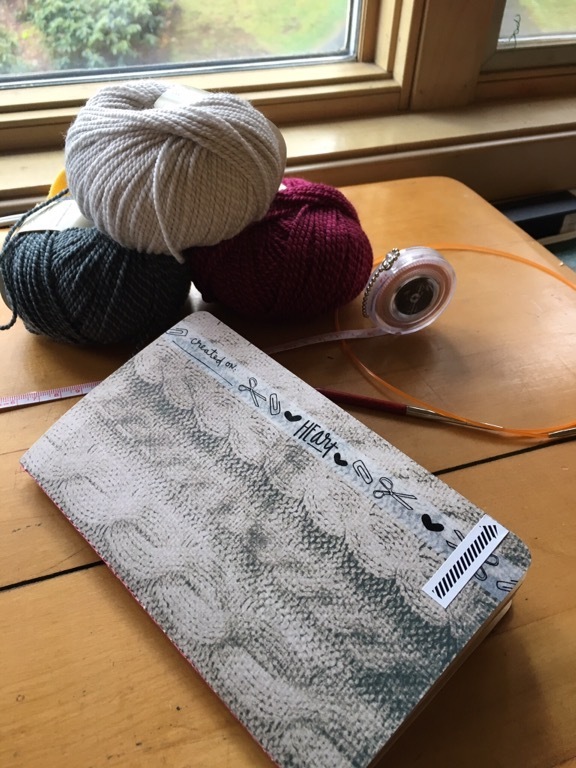 This morning, I am going to open my notebook to check my to-do lists, jot down a few random thoughts, add some hat pattern names to my knitting wish list, and get my day in order.